You might have seen either my Bible Journaling Gift Guide, or my Art/Papercraft Gift Guide. Well this gift guide’s a bit different. One of my readers, Heather, sent me a note about a topic she feels passionately about – and I agreed to share her message with you. I think she’s on to a great idea for this post, and if you know someone struggling with health issues, this might help you too. soft and plush slippers or throw – it is important to be comfortable. a book on tape – sometimes an actual book can be hard to focus on. a portable phone charger and cord – for times when long hours are spent waiting in hospitals and there’s not a plug nearby. collection of travel size items – treatment means a lot of traveling back and forth to the hospital, sometimes out of state. for those who can’t have live flowers or plants – make them a tissue paper bouquet or hanging mobile! grocery shop – call and ask for a few items to add to your own list. take out the trash for them weekly. cook for them – perhaps *in* their home. the smell of home cooked food, soups, breads…mmm. donate to a research foundation tackling their illness. yard work – either rake/mow yourself, or hire a service for them. Uber gift cards to get them to doctors appointments, or gas cards to help pay for their expense. Give a mom a rest and take their kids out for a day of shopping and play – maybe bake Christmas cookies with them. Or perhaps take their dog for a weekend, or set up a weekly play date at your house. Scoop and change cat litter for them on a regular basis. Pay a bill for them that you know they need help with. If they have a PO box or a group mailbox down the street, arrange to pick up their mail for them and drop it off inside the screen door daily. and of course a hand written note is always the most meaningful! Last night I made a donation to Mesothelioma Applied Research Foundation in Heather’s name…feel free to do that too if you’d like. Please share this post on your Pinterest or Facebook or other social media to help your friends give with compassion, too. 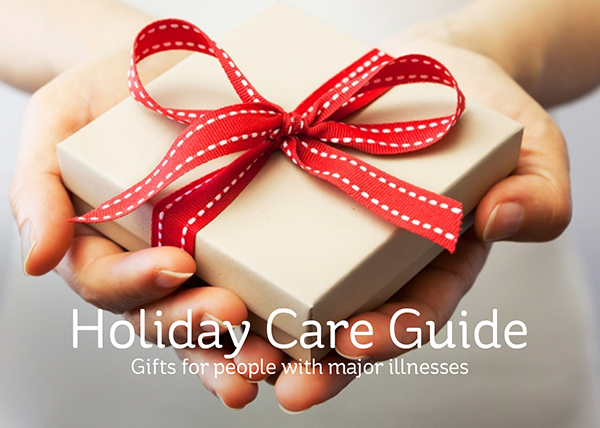 And leave your gift ideas in the comments section, too, especially if you’ve had a major illness and have thoughts on items that would be helpful. GREAT POST!! Sandy your heart is HUGE! Your post will help people who’s friends are very ill. It is always a big question – what can I do to help…. When my husband had cancer two years ago, our neighbors made a gift basket with lots of cards and good wishes. Inside were gift cards to the local pizza/fast food places (so I didn’t have to cook after long days at the hospital), gas cards (lots of traveling back and forth to the hospital), dollar bills to help with parking fees, a prayer shawl made by ladies at our church (chemo made him cold), gift cards to our drug store to help pay for tissues, lotions and other medical items. His sports buddies made a poster with encouraging phrases on it and signed their names. We framed it and he treasures it still. My daughter asked family and friends to donate a Tshirt with a logo that said something about you and she made them into an awesome Tshirt quilt to keep him warm! We were so lucky to have such thoughtful friends and family. By the way, he is cancer free now and doing great! SANDY!!!!! You are incredible.. I am so touched that you made a donation to MARF in my name.. You are, without a doubt, one of the kindest, biggest hearted people I’ve ever had the pleasure to know, even though it is through blogs! I love it! Thank you again for all you do.. this is such a great gathering of ideas! And the comments from your other friends and readers! So many great ideas! <3 Thank you again for EVERYTHING..
CONGRATULATIONS Heather! You are a true survivor! My sister lost her daughter to a different type of cancer 15 years ago, next week. She passed away on her 23rd birthday. During that 14 month period, another sister and myself would take turns (leaving our own children/husbands) and go to her home, as she also had 2 younger teen aged children who needed guidance and “normalcy” and still be at home. We live an hour away so we’d go prepared and stay for 2 or 3 days at a time. On my days, I would go to take care of the cooking and cleaning for the family. My other sister would go and stay on the days of appointments. I’m so sorry for the loss of your niece.. those experiences stay with us forever. How wonderful of you to dedicate so much time to her care. I don’t know what I would have done without the help of my sister in laws and parents..
You are right! ever underestimate the power of a simple question. You hit the nail on the head! It is so thoughtful of you to write such a post. I’m struggling to find the right words to put in Christmas cards to a few friends who are struggling through some rough chemo treatments right now. It is best just to write from the heart. You can never go wrong. Thank you, Heather. I’ll sit down when I have some quiet moments and do just that. Can’t think of a more “in the Season” “real Christmas spirit” post! Sandy, your previous challenges have taken you through a hard place that, with determination and resolve, has given you such a “giving heart” and caring spirit. Love your art and projects BUT ADORE your heart! I have a friend that is almost over the worst of Chemo breast cancer treatment after she was diagnosed with Stage 4 – about a year ago. I have learned so much about what not to give but weekly handmade cards were an easy gift. Just learned she keeps them all on a table near her bed as her private art gallery – she said they brought her happiness just having them near. It was my honor to provide the weekly encouragement notes and art and so easy to do while thinking of her and her struggles and her sweetness and life. This gift post that you have given us will be a blessing for many others that are struggling with health issues. Thank you so much for this. Maybe everyone could comment on your post with a suggestion that has been helpful for them and we could all update your list with more ideas. Here is my idea: I remember years ago that a friend was in the last stages of living on earth due to cancer and unable to have flowers in her hospital room. There was a curtain around her bed and no visitors other than family. She was not allowed flowers so I made 10 huge paper flowers that could be safety pinned to her curtain – very colorful but no odor or glitter. A child might like colorful paper balloon shapes with their friends or classmates names written on. You have to check with the nurses station to see what can be brought in. I found my idea worked since it didn’t take up any room and could easily be pushed back with the curtain. I would also suggest that you leave the list on your sidebar for quick reference! Not that you have anything else to do right now – LOL. This is a good guide and I’m sure that people reading this could expand on the things that would help someone. Christmas isn’t about getting, it’s about giving. Everyone needs to teach young people so they can make this a part of their life and not just a one time thing. Great ideas, Sandy and Heather! You’re right – for those of us who have been blessed with good health all our lives, and haven’t known friends or relatives who’ve struggled with major health issues, there’s a sense of being lost in the woods when we’re suddenly faced with trying to help when someone close gets a frightening diagnosis. Thank you for shining a light on this problem – now I see some things I can do!